New York (TADIAS) – When Ethiopia welcomed Dr. Abiy Ahmed as its new Prime Minister nearly a year ago on April 2nd, 2018 he had inherited a country that was under a state of emergency – a society under heightened security following a relentless wave of nationwide protests. A year on Ethiopia is no longer under State of Emergency. There are no journalists in prison. Freedom of expression is more evident, whether it’s from the arts sector or the political stage. And most importantly, the country is gearing up for what would hopefully be a groundbreaking first-ever season of free and fair elections led by former judge, opposition leader and human rights activist, Birtukan Mideksa, who is now serving as the new head of Ethiopia’s Election Board. To be sure there are many serious challenges that remain. As the Financial Times reported in a recent article “Ethnic Rivalries Threaten Abiy Ahmed’s Reform Agenda.” PM Abiy’s administration needs to better address the unfolding humanitarian crisis of internally displaced people across Ethiopia, which has been severely exasperated by the ethnic-based violence particularly along border areas of Oromia and Somali regions, but also in Central and West Gondar zones of the Amhara Region. According to Ethiopia’s disaster prevention chief, Mitiku Kassa, about eight million people are currently in need of humanitarian assistance. The magnitude of this humanitarian crisis cannot be ignored and requires urgent solutions. A year ago here in the United States Congress had been preparing for an unprecedented vote on Resolution H. RES. 128 denouncing the Ethiopian government’s human rights record the same week that PM Abiy was being inaugurated. In this past year alone, Ethiopia has re-forged relations with neighboring Eritrea and Ethiopians in Diaspora have been encouraged to return home and be part of the greater movement under the popular sentiment of “Breaking the Wall, Building a Bridge.” Economically, Ethiopia is continuing its annual growth rate of 10% — one of the fastest in the world and last but not least, the nation has its first female president and first female Supreme Court president as well as a gender-balanced Cabinet. These are all historic achievements to be proud of. Among the multitude of challenges, that PM Abiy faces as he starts his second year in office next week, include the still nascent media environment that’s dominated by a handful of state-affiliated outlets and formerly exiled political activists. Although freedom of expression is blossoming the political media is still in need of a new culture of independent journalism with adequate resources for professionals in the sector, especially as the country heads into a national election season. The good news is that PM Abiy is cognizant of the fact that in today’s digital age the media sector is not limited only to politics, and he is a big supporter of the arts community and the capacity of its members to encourage social change. The arts, as we have demonstrated in Tadias Magazine for the past 15 years, play a major role in fueling social change and should not be seen merely as entertainment. If it wasn’t for the award-wining film “Difret,” for example, the world wouldn’t have known about the landmark Ethiopian court case that outlawed the archaic culture of abducting young girls for marriage, nor the brilliant lawyer and women’s rights advocate behind the case, Meaza Ashenafi, who is now the President of Ethiopia’s Supreme Court. In a similar manner singer and songwriter Teddy Afro has been preaching the idea of ‘Medemer,’ and unity in diversity in his music long before the term became a fashionable political cliché. Likewise, the new movie Anbessa — that is executive-produced by model and humanitarian Gelila Bekele and making the rounds at various international film festivals this year — is putting the spotlight on the impact of housing expansions that are affecting local agricultural communities that surround cities across Ethiopia. Artists, writers and musicians have always impacted and led social change movements in their communities and it’s vital that they’re voices are included in more ways than one when speaking about development or national growth. 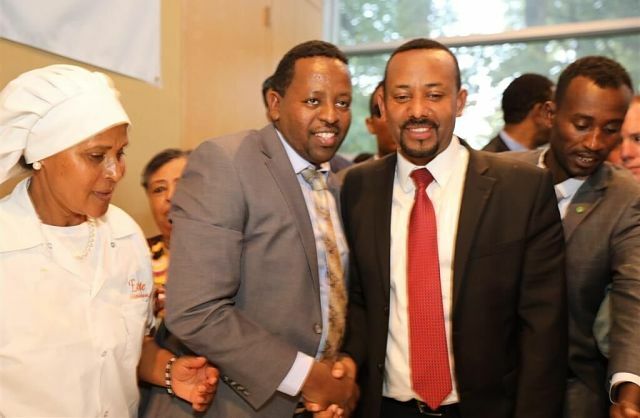 In the end Abiy is in many ways a creation of our collective imagination and aspirations for a nation that not only embraces a plurality of identities and voices, but one that also becomes more equitable and inclusive. The continuity of Ethiopia depends on all of us, both at home and in the Diaspora.